These days I almost always have a batch of kimchi going in the fridge and my latest batch was ready. I could not wait to to try it and I knew exactly what I wanted to make, a kimchi pizza. Kimchi generally comes with a lot of liquid so you often need to squeeze the excess off. When making some dishes such as the kimchi quesadillas you even need to think about removing some of the moisture from the fermented cabbage to make sure that you do not end up with a soggy quesadilla. With a pizza however, I figured that all of that flavour packed kimchi juice would make the perfect pizza sauce. Bacon goes so well with kimchi that I did not even think about making the kimchi pizza without it and you couldn’t have a pizza without some cheese. I still wanted something else on the pizza and I thought that some shiitake mushrooms would do well. Since I had just cooked some bacon I lightly sauteed the mushrooms in the grease before adding to the pizza to get even more of that bacon flavour. After the pizza came out of the oven I finished it off with some fresh sliced green onions and some toasted sesame seeds. The kimchi and bacon pizza with shiitake mushrooms exceeded all of my expectations! The spicy kimchi all covered with gooey melted cheese went so well with the salty bacon and everything worked really well in pizza form including the kimchi juice ‘pizza sauce’. I am going to have to make this again soon! Cook the bacon in a pan and set aside. Add the mushrooms and saute until tender, about 5-7 minutes. Serve garnished with green onions and sesame seeds. This is wonderful, I'm starving after reading this post! I am completely obsessed with kimchi… So good to see a fellow Canadian food blogger hyping up kimchi in non-traditional ways! I love Korean food because of kimchi, so this recipe is awesome! What a GREAT idea to put kimchi on pizza! Pizza looks awesome. What is kimchi? WOW Kevin, I never thought of adding kimchi to a pizza! That is brilliant! I just made some kimchi and when it's old enough, I'd like to try this recipe. Thanks! Waw,…I never thaught either to use kimchi to top a pizza!! What a grand & clever idea!! The pizza looks excellent to me! A fusion pizza – would not mind a couple of slices of that!!! Pizza Hutt here in Japan does a Korean Bulugogi pizza that you might like. It's good but it would be better if the Japanese could get over their obsession with putting mayonnaise on their pizzas. The most common pizza here is tuna, corn and mayonnaise! Here's their pizza menu online (all Japanese but english headings and scary pictures! I'm very sure this pizza tastes great because I love kimchi and the shitake mushrooms. Looks awesome. I'll have to try this. Thanks for sharing. I'm pretty sure this pizza could only come out of your kitchen (and I mean that in a good way). Awesome combination of ingredients! I bet this pizza would do so well in pizza places here. been having bad kimchi cravings lately and went out for Korean last night. This is yum! i want this for lunch now! 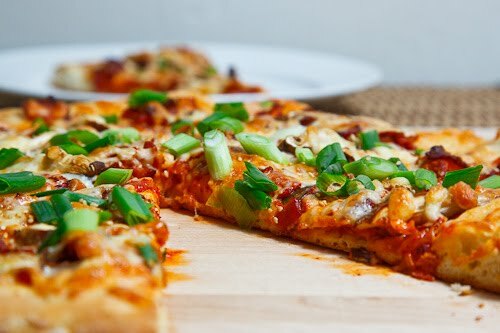 I've never imagine kimchi as pizza topping..
Kimchi pizza is seriously one of my favorites! Growing up, this was the perfect compromise of Korean and American food in my house that seemed to please both my parents and I! Huge fan of kimchi and one of my favorite chicken dishes is just chicken tossed with kimchi, ginger, garlic, dash of sesame oil, and marinated overnight. I just simply throw it in a wok the next day. Nicely done and love the pic! Wow – what a fantastic sounding pizza! I am learning to love kimchi and just bought our first jar to play with at home. This sounds like a perfect way to use it! 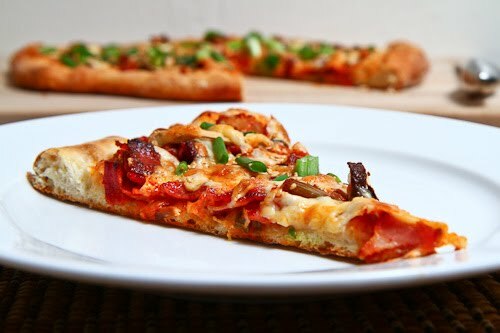 I LOVE kimchi, bacon, mushrooms, and pizza, so this sounds heavenly! I have to try this soon! WOW how creative are you Kevin!!! This looks freaking insanely delicious — talk about using creativity!! I am going to try this one on my next pizza night 🙂 beautiful blog you have here! I've never had Kimchi before, but this looks amazing! And I love a thin pizza! whoa! My new batch of kimchi is ready, too… I've been wondering how kimchi would taste on pizza. It's great in burritos and on tostadas, too. I might have to try the pizza. You have great ideas, Kevin. Thanks for sharing. Looks incredible Kevin! So yummy! Looks absolutely delicious, but how many servings does it give by the way? Anonymous: It is a large pizza so I usually get 4 serving out of it. Hi Kevin! I eat kimchi every day, but never have I had kimchi pizza. How brave and wonderfully creative of you. Wow this is definitely one of the most interesting sounding pizzas I've seen in a while!! As far as I see, you are a Kimchi king! Keep these excellent recipes coming!! Kevin, I have a crew of Korean painters working for me at the moment and they brought me some home made Kimchi, the first thing I made was your pizza recipe, excellent, excellent. I'm from Romania, Eastern Europe and I've never had kimchi. How is it? you make yours at home? I only saw the making of kimchi in a Tony Bordain "No Reservations" Show and it seemed kinda complicated! Espresso Style: Kimchi is on the spicy side and packed full of flavour! I really like it and make it myself: kimchi recipe If you can find the Korean chili pepper flakes it is actually pretty easy to make yourself.